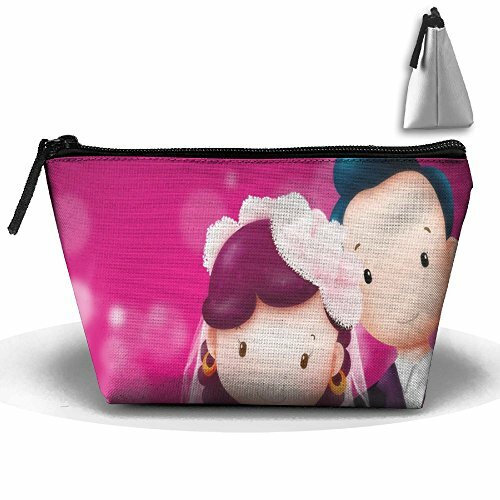 Wedding Of The Bridegroom And The Bride Cute Trip Toiletry Bag Trapezoidal Zipper Receive Bag Travel Fashion by BabylLave at SCRHI. MPN: GFADF455GDF-25253595. Hurry! Limited time offer. Offer valid only while supplies last. They Are Large Enough For A Fairly Large Tote Size Bag.Drawstring Works Well And Pulls Easily. Nothing To Snag Or Scratch Your Leather Or Suede Bags. They Are Large Enough For A Fairly Large Tote Size Bag. Drawstring Works Well And Pulls Easily. Nothing To Snag Or Scratch Your Leather Or Suede Bags. Very Versatile. Adequate Storage Capacity, Daily Can Be Used As A Sewing Kit, Kits And Other Items Stored. Go Out Can Also Be A Cosmetic Bag. Material: 600D Plain Oxford Cloth. Size: Long 8.7 * Wide 2.8 * High 4.7 Inch. Large Enough To Fit Your Makeup, Yet Small Enough To Take With You On The Go. Container Toiletries, Cosmetics, Certificates, Charging Treasure, Power Cord, Change Etc. Multi-Function----It Can Be Used As Make-Up Bag,Handbag And So On. If you have any questions about this product by BabylLave, contact us by completing and submitting the form below. If you are looking for a specif part number, please include it with your message.